Despite exercising and watching what you eat, you can seem to get rid of stubborn fat. Shrink stubborn fat the painless way with FDA-approved treatments. Cellulite is a condition where lumps and dimples appear on the skin, often around the thighs and derriere. The telltale ‘orange-peel’ appearance of cellulite happens when the skin’s fat deposits are pushed against the connective tissues and protrudes. Stretch marks are streaks that appear on the skin’s surface. They often begin as red or purple, and fade to a light white or beige. While stretch marks are most common where fat is stored, they can appear in areas where the skin has been stretched. If you are experiencing excessive sweating or body odor and it’s causing you embarrassment or staining your clothes, now you can solve it with a non-invasive treatment. Having extra hair at undesired areas can take up a lot of your time with the shaving and plucking needed . You can now achieve permanent smooth and hairless skin by destroying both root and follicle, leaving you with fuzz-free skin. 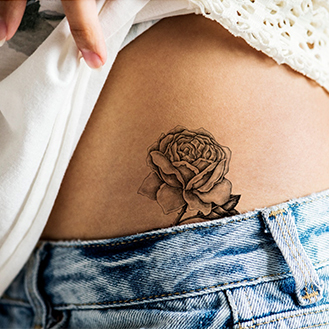 From ex partners’ initials and names to poorly designed tattoos, if you regret or simply just have a change of mind, you can now remove tattoos safely and painlessly. If you suffer from urine leakage on sudden exertion, coughing, sneezing, laughing or even when lifting something heavy., you can now treat it with a non-invasive treatment, without even having to remove any clothes.